The Minecraft developer is almost ready to deal out a new hand. If you got in early on the Minecraft craze, you know the drill. 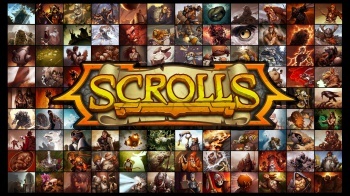 Minecraft developer Mojang is preparing to roll out a paid PC beta for its next game, Scrolls, by the end of April. Those who buy in early will get to try out the strategy/trading card game as it's developed, and will retain ownership as it transitions from beta to the full release. There's still a good amount of work to be done before version 1.0, but positive feedback from the game's alpha build has the team confident that it's ready for the gaming public. "We've been wanting to release it for a while," admits Mojang co-founder Jakob Porser, "because we want it to have the same sort of development as Minecraft. We'll release it early at a discount. With the help from our community, we'll take the game to the next level and see what we want to do and what they expect out of the game and you can work around that." The game is based on the collectible card game genre, but Mojang is committed to a single-purchase price model. Once you buy the game (or the beta) you can expect long-lasting support via free updates, not unlike the development model Mojang has refined for Minecraft. "I don't think there is any way of avoiding that expectation," says Porser, "but at the same time you can't really complain. It's working. We like to think of the way we develop games as more of a service." Mojang has considered premium payments for features like cosmetic upgrades, but fans shouldn't be concerned that Scrolls will end up as a battle of wallets - Porser assures that actual gameplay will be kept "as far away from monetization as possible." Porser jokes that if the team was in it for the money, they wouldn't be making a digital strategy board/card game. Minecraft has sold over 25 million copies total, giving the team a serious buffer to fall back on if Scrolls sells poorly. "I have no expectation that Scrolls is going to sell way beyond Minecraft," says Porser, "absolutely not. What I would like is for the game to find a core, a bunch of players that actively love the game. The beautiful thing with Mojang and the success of Minecraft is that we really don't have that pressure, that every game has to sell x amount of copies or we're going to go bankrupt. So we're in a good position that we can experiment and try some of the stuff that we want to do and we are going to do that." Scrolls will begin its PC beta in late April. Once it's a little further along, Mojang plans to port it to Mac, with Linux being a potential destination as well.